Embattled out-gone President Yahya Jammeh of The Gambia has asked a shift in deadline of midday to 4pm to vacate office as ECOWAS soldiers close on him. Government sources said the request was made when the leaders of Guinea and Mauritania arrived in the capital, Banjul, in a last-ditch diplomatic effort to get him to cede power. A regional military force that crossed the border in support of his democratically elected successor, Adama Barrow, was awaiting orders on Friday. Marcel Alain de Souza, chair of the west African union Ecowas, said troops would force Jammeh out if he refused to leave the country. The West African troops entered the Gambia on Thursday night, hours after Barrow was forced to hold his inauguration as president in Dakar, the capital of Senegal. De Souza said the west African force, which includes tanks, has so far met no resistance. Banjul, the capital, was deserted on Friday. Dozens of vultures spread their wings on the large ground outside State House, and a lone cyclist, perhaps one of the few remaining tourists in the country, made the most of the empty roads. The country’s chief of defence staff, Ousman Badjie, was seen speeding in the direction of Banjul. He has switched allegiance several times over the past month, and was celebrating with Barrow supporters in the streets last night. 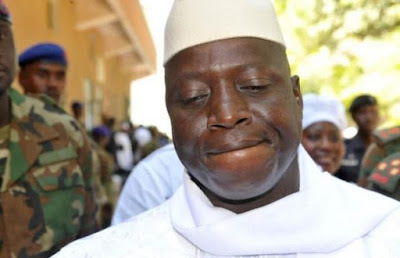 It is unclear what side he and the military would take in the event of an Ecowas attack on State House, though most sources believed he was no longer with Jammeh. The twitter handle of Charles Onyango-Obbot ‏@cobbo3 said “ Jammeh asks for deadline extension – from midday (local time) to 4pm!